Michael Barnett is a casino consultant who is paid to teach casinos about how their games are being beaten. As he promotes himself to be a world-leading authority, and has been in the gaming industry for some time, I was particularly interested to acquire his roulette computer. He claims to only sell the device to casinos to evaluate the vulnerability of their roulette wheels, although one of my players who is clearly not affiliated with casinos was permitted to purchase. I assume he couldn’t say no to an unjustified amount. I received the device for free from my player. It appears it is more a learning aid for casino staff than a device intended to be used for actual application in casinos. 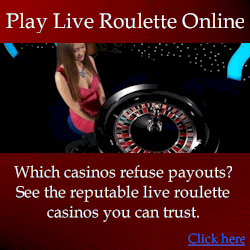 It uses the typical roulette computer algorithm that I explain at my roulette computer website (click here), which is a very simplistic and dated approach he dresses up to promote as something sophisticated. His device does not account for ball deceleration changes, is incapable of any effective method of isolating to spins with more predictable ball bounce (scatter), and can only predict when the ball is at a specific speed. Essentially it is a replica of 50-year old visual ballistics techniques that are only effective on easily beaten wheels. For those familiar with my roulette computers, it is similar to my lite roulette computer (see roulette computer comparison), although my lite computer can predict accurately anytime in the spin, whereas Barnett’s device cannot. This means it is impractical in the real casino environment regardless of its other deficiencies. Accuracy achieved with this device is much the same as basic visual ballistics methods. For it to achieve any accuracy, unrealistic and rare wheel conditions must be present. 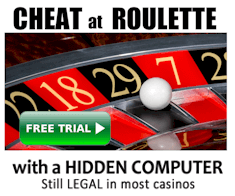 In other words, it all works nice at home on the kitchen table – not in the real casino environment. But it makes no difference to Barnett – he only needs to convince casinos there is a threat for him to profit. Certainly there are real threats, but not from yesterday’s technology. VERDICT: Michael is running a business of teaching casinos old techniques. Nevertheless, he needs clients to believe he is “up to speed” on the latest developments. Unfortunately for casinos, this is not the case although certainly he would claim otherwise. Fortunately for professional players, consultants such as Barnett are one step behind modern methods as reflected in technology he has developed, such as his roulette computer. He is great at re-inventing the wheel. For any casinos considering hiring Mr Barnett, I suggest spending someone’s losings on the book “Casino Game Protection” by Steve Forte – you’ll find it much better value for the same information. And if any casinos want to assess how beatable their wheels are with 50-year old algorithms, I suggest the free visual ballistics course on my site.